“Online/digital” includes SEO, websites, blog posts, social media management and more. ClearPath Society® has been around nearly 10 years with Members from multiple countries and every state in US. ClearPath Society® is the Level II service of Jerry Jones Direct. You’ll have ongoing access to the ClearPath Society® CustomerHub, an online repository of dozens upon dozens of patient attraction ads, patient retention tactics, practice growth systems, audio and video trainings, phone success system training (live and multiple times each month), a monthly newsletter (8 to 12 pages) written by Jerry himself, titled, The Practice Profit Insider™, Dentistry Confidential®, Jerry’s monthly business of dentistry audio series, and regular and direct communications from Jerry that have the power to impact your practice’s profits, when applied. You will always get blunt, honest, and straight-forward advice and answers to your questions. WARNING FROM JERRY: If you want to truly grow and get that practice of yours where you want it, the road to success isn’t easy. While we try to make it as easy as possible here at JJD’s ClearPath Society®, I have no doubt and can guarantee you’ll still run into potholes, obstacles, roadblocks, bad/mean people, angry employees, embezzlement, set-backs, lawsuits, dental boards, bankruptcies (sometimes), divorces (sometimes) and other not-so-pleasant surprises. If you run into anyone that disputes that, run…run very fast the other direction. Thing is, it’s not necessarily that stuff that’ll kill ya and your buzz for success. It’ll simply be your inability one day to get back up and go at it again. When you give up, you’re done. Solution? Don’t give up. No matter what. Entrepreneurship is the toughest damn thing you’ll ever do aside from marriage. So, you must be ready to accept the challenge. ClearPath Society® is designed for the strong to succeed; I can tell you from experience the weak will be chewed up and spit out. Mr. Jones to advise me? Over the last 2 decades, Jerry has delivered more new patients to dental practices than any other single man, woman or beast. His advertising and business strategy has been responsible for directly impacting and helping hundreds of practices go from scratch to massive behemoths, from small, solo practices to multi-location/multi-doctor conglomerates and everything in between. Mr. Jones has started 3 dental offices in the last 15 years. His from-scratch 6-op/3-doctor dental office, Wellness Springs Dental® in Salem, Oregon, is a direct result of his systems, strategies and processes, developed to grow ANY practice. Nearly every single aspect of Membership has been tested and proven in his own dental office before ever seeing the light of day for general Membership. Jerry believes in investing his own money to prove his marketing strategies work before you’ll ever spend a dime of your own money to find out. You’re positioned for success from Day 1, by the simple fact Jerry and hundreds of other Members have blazed this path before. ClearPath Society® … It’s really about no longer being alone in practice and experimenting on your own to find out what works in marketing and in business. Those trial and errors can be costly not just in real dollars, but more importantly, time most of us would rather not waste. ClearPath Society® gives you the confidence that you can dive in, grow your practice quickly with proven best practices developed by Jerry, proven by Jerry and used in practices all over the US. Becoming a Member of ClearPath Society® is very affordable for any size practice. Membership is currently $597/month for solo practice doctors (in one location) or $997/month for doctors with associates, partners or up to 3 locations (for more than 3 location, inquire for pricing). Each Member also commits to a one-time $197 application fee. Your first month’s total if you are a solo doctor with one location (Silver Membership) is $794.00 and $597/month thereafter. If you qualify for Gold Membership, your first month’s total will be $1194 and $997/month thereafter. While there are no long-term commitments or contract requirements, Members are encouraged to give Membership at least a 6-month “better-than-old-college try.” Annual pre-pays are available for those sure and committed: Pay for 11 months and receive 1 additional month at no additional charge. We also offer our Members protection against future price increases. What you pay now is what you’ll always pay as an active Member. Your monthly dues (or annual pre-pay) never increase, unless you choose to relinquish your Membership and re-join at a later date. If you decide to, you can do so at the then-current monthly subscription. Taking advantage of just one System, best practice, ad, or technique can more than cover your annual investment in Membership. Membership is required to access any Jerry Jones Direct (JJD) marketing or consulting service. This allows you a single point of contact for coaching, best practices and more for every practice growth need you have. From new patient getting online or offline, to consulting and more. Great question! You bet. In fact, we don’t just provide one bonus, but actually include multiple bonuses! Currently, the value of the “bonuses” alone exceeds a massive $70,000 in actual retail price and value if you were to purchase them independently. *Please note: Silver Level Benefits are highlighted in silver. Gold Level Benefits include all Silver and also those highlighted in gold. Practice Profit Insider™ Monthly Newsletter – Members claim this is by far one of their most treasured Member Benefits. Every month, Jerry personally pens a newsletter written just for Members. Contents vary monthly, but always include actionable projects to increase your practice profitability, examples of ads, Member Q&A, and much more. $199/month value. Gold Member Memo – Sent throughout the month, this Memo written by Jerry for the ML/MD doctor, will help you better master the multi-location/multi-doctor business model, ensuring you’re thinking accurately and regularly about your empire. $199/month value. Single-Location/Single-Doctor License – Each level of Membership has its own license with unique benefits. Silver Level is for single-location and solo practice offices. Multi-Location/Multi-Doctor License – Gold Level affords multi-location/multi-doctor practices a multi-site, multi-doctor license to all materials. Local Media Mind Control System – Press releases offer a fast, effective and inexpensive way to get the word out about your practice and what you’re doing to help the local community. Jerry offers a number of different press releases in this System for Members to use. 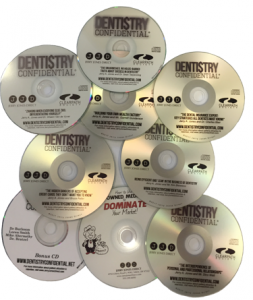 This method helps Members’ offices generate thousands of dollars in free publicity each and every year, and hordes of new patients. $499 value. “Online” & Telephone Training Seminars – Jerry offers a number of different opportunities every year for Members to tune-in to short, info-packed seminars. He will often interview guest experts you should learn more about, who’ve helped him with his office, or, personal life. $199 value. COACHING – For Gold Members, each month, Jerry is available for pre-scheduled, 30-minute calls to keep you on track, discuss growth and troubleshoot vexing challenges in practice. Tap Jerry’s wealth of knowledge on start-up practices, growing mature practices, strategic marketing campaigns to drive more high-value patients, transitions and more. Value: Priceless. Weekly Memo Email – Jerry has been writing this weekly memo for over 6 years. Members comment about the kick in the pants it gives them – not too often, but just enough. It’ll help keep your momentum moving forward and mindset fixed on success – not failure – and, increasing profits! $99/month value. Call-in Day – Every other month you’ll have an opportunity to get on the phone with Jerry during his monthly call-in day. No question is too trivial or too tough. After nearly two decades of helping Dentists and other entrepreneurs grow their businesses, Jerry’s heard it all. $200+/month value. PAY IT FORWARD DENTAL – Jerry recently teamed up with a ClearPath Society® Silver Member to create an incredible positioning tool you can tap, while simultaneously giving back to your community. The unique approach requires patients receiving services to give back – and pay it forward. Learn more at PayItForwardDental.org. The Unfair Advantage Patient Reactivation System Tap the best source for a super-fast revenue boost! Easily, inexpensively reactivate inactive patients with Jerry’s easy-to-implement Patient Reactivation System. What’s more, you can roll this System out 2-times every year, to make sure your patients remember where you are and what you do (and why they chose you to begin with!). $897 value. 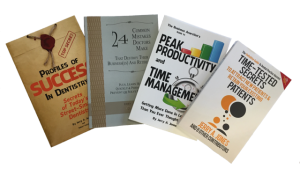 Peak Productivity & Time Management System – A Big Challenge dentists often face is time management outside the office. In this complete and counter-intuitive System, Jerry shares with you how he manages his time and the people around him. This System will completely change the way you think about time. $899 value. EZ Patient Financing System – Most consultants will tell you to never be the Bank for your patients. Jerry’s approach has always been the complete opposite. In this System, you’ll learn how to be the Bank and what you’ll want to do to control risk, evaluate patients for financing and much more. $899 value. Productive Referral Strategies – If you want to increase referrals from existing patients, there is no better place to start that this Special Report written by and provided to Members exclusively from Jerry’s friend, Dan Kennedy. $199 value. Dental Practice Marketing Advisory Letter – In this limited-edition, 4-issue newsletter, Jerry works side-by-side with his friend, the legendary Dan Kennedy, to bring you even more smart practice growth strategies. This information has never before been shared by Dan in any other media. $398 value. Need Office Help?If you’re seeking new team members, or, even an associate, don’t worry. Jerry’s got all you’ll need to make it happen. With the power of craigslist.com and Jerry’s very detailed Help Wanted ads, you’ll find a “rock star” in no-time flat. 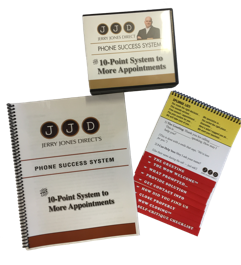 10 Point Phone Success Training System – Well over a decade ago, Jerry Jones Direct began offering its clients’ team member training on phone skills to increase the number of new patients scheduled. In this System, Jerry has hired the single, top authority on Phone Appointment Success to provide an in-depth training with 13 audio CDs, a flip chart and training manual. Plus, as a Member, you and your team can tune in every month for FIVE different LIVE coaching sessions! $2995 value. Associate & Partner Recruiting System – Complete with companion audio program, this newest addition to ClearPath Society® Member Benefits outlines the process Jerry uses to attract new doctors to his offices and that of other practices he works with. The System includes the process, considerations to be made, how to evaluate when and who would be right for your practice and unique situation. Jerry also includes website and email copy, a number of ads, letters and sources you can use to recruit your next Superstar associate or partner! $15,000+ value (based on cost of headhunters). 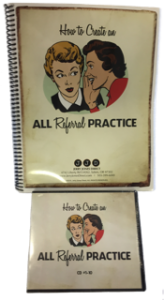 The ALL REFERRAL PRACTICE – Because nothing beats a referral patient, this incredible training (10 CDs, workbook and transcripts) will give you the tools and techniques to finally create a practice environment where referring is the norm and an expected behavior of your patients. Just one idea from this training helped launch a powerful annual referral marketing campaign that has driven over 3,000 new patients to one Member’s practice. $2995 value. FSIs – One of the most powerful weapons in Jerry’s new patient attraction arsenal, FSIs, of free standing inserts, are both economical and effective. You can use these to attract general new patients, or, can niche into different areas of dentistry such as dentures, cosmetic and implant dentistry. There are over a dozen different, proven examples you can immediately tap into. Private clients paid up to $2500 to have these developed and have since agreed to have them released to their fellow Members, so you too can enjoy the benefits. Billboards – We’ve created dozens of giant billboards for Members. A segment of specialty ad creation all its own, billboards can be a useful addition to an already successful marketing saturation campaign. New Mover Campaigns – Years back, Jerry developed an incredibly successful campaign to recruit new movers who’ve joined your community. 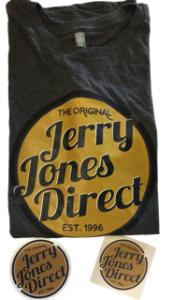 Choose from the do-it-yourself campaigns Jerry’s created, or, have JJD handle it all for you, using the direct mail pieces Jerry’s created. RETRO – Jerry’s big on retro looking ads. Introduced in 2012, Jerry’s successful Retro Ad series has corralled thousands of patients into offices all over the US, Canada, England and Australia. You can even use his successful Retro “door hanger!” The series includes FSIs for new patients, an FSI for denture patients, implants and more. This suite of ads is easily valued at nearly $15,000! Postcards for New Patients – Jerry has literally mailed MILLIONS of postcards. In fact, at the 10-year mark in business, he counted and it was well over 5 million! Since then, he’s mailed millions more. Take advantage of someone who’s written the book on direct mail for new patients and use any one of the dozens and dozens of postcards Jerry has personally developed and used for new patient attraction. ValPak Ads – If ValPak works in your area and you want to make it even more effective, test out Jerry’s ValPak ads. If you’re just using what the rep for the company gave you, you’re leaving a ton of new patients “on the table.” One Member reported that the changes Jerry made to his ValPak ad doubled the response. Plus, he’s done a number of different versions for his own office, too. Dental Health Care Club® – Over a decade ago, Jerry created a cool club for patients in his office. Offered to patients without insurance, this can be an incredibly easy way to retain awesome patients and, keep them coming back for regular care, while giving them the ability to say YES to your treatment options. This complete System includes in-office signage, and much more. Treat Headaches? 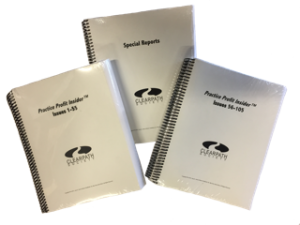 If you’re treat headaches with TruDenta or another headache relief system, never fear – Jerry’s developed a letter to be sent to patients, display ads for in-office seminars, FSIs and more. Members gain access to a complete marketing system to attract more headache relief patients. Treat Snoring & Sleep Apnea? Cool! Jerry has a great System he’s created for one of the top sleep docs in the country, and, it’s yours free to use with Membership. Sedation Dentistry – If you’re offering sedation to your patients and you want to do more, just use Jerry’s ads he has created specifically to target high fear, neglected patients. Each case can be the equivalent to an entire day’s production. With that kind of ROI…you’ll want to dive into these ads and get them out into the community. if I am unhappy with my decision? At JJD, every product or service we offer comes with our money back guarantee. What’s more, with ClearPath Society®, you’re never locked into a long-term contract. Return all the Membership materials we’ve provided, intact (with tracking #). Upon receipt, we’ll issue you a prompt and courteous refund with no hassles. Remember: After your initial 90 days, if you are unhappy with your decision to remain a Member, you can cancel at any time without any further obligation. …And if you decide Membership is not for you, we’d prefer to remain friends for the rest of your career! Your practice and your life changes, as does our business; so while we might not be right for you, right now, there’s a very good chance we will be at some point down the road! It’s easy to apply. Simply click on the APPLY NOW button below, or, call our office. And, remember, we got your back with our no-risk-to-you guarantee…We want you to be successful. Next, choose your level of membership and then click the Sign Me Up Now! button below…Or, call us at 503-339-6000 and ask to speak to a Member Ambassador.